HP shocked the world when just weeks after launching their flagship iPad 2 competitor they cancelled production, shut down their WebOS operations, and announced intentions to exit the consumer computer hardware business. The subsequent firesale of TouchPads actually put these devices in the hands of a huge part of the market. CNet’s Brian Cooley’s video on the top 5 things you could do with a $99 TouchPad (or any other tablet for that matter) cut to the core of where the Tablet market is going. 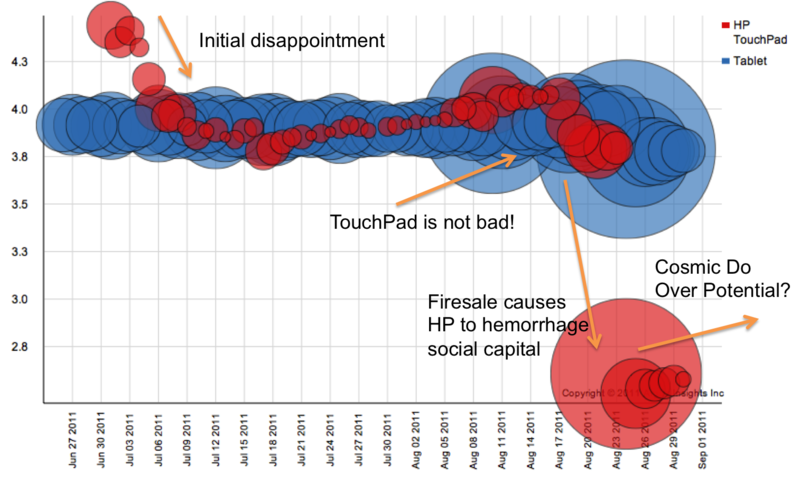 HP is shocking us again by announcing another production run of TouchPads set at the same firesale prices. Wait, huh? You cancel the product and now you’re going to sell more? Is there a supply of touchscreens and stainless steel frames sitting around waiting for loving hands to give them life as TouchPads? Is this the start of HP taking a page from Coke’s strategic blunder in the 80’s? Will HP release the TouchPad Classic in time for CES? users in the data, pulling the TouchPad down to the lowest-rated tablet on the market. Feature sentiment didn’t change, but the HP/Palm/WebOS brand was tarnished in customer feedback. What does this mean? It means that HP threw the baby out with the bath water. It means they have an opportunity to recover. As one blogger pointed out, just think if the millions of dollars spent to have Russel Brand and others pitch the TouchPad after the relaunch had been spent subsidizing the purchase of the TouchPad itself. The iPad capitalized on the install base of iPod Touches and iPhones to scaffold early users through the rocky first few months of existence. There weren’t enough Pre and Pixi users to leverage the same effect for HP. The TouchPad could be the trojan horse HP needs to win a larger share of hearts and minds. The world needs HP to stay in the market. We need competition to drive innovation. A market without competition becomes stale…and nobody wants that.